The goal of the NREX is to develop a web-mapping tool to enable discovery and assessment of energy, infrastructure, environmental, wildlife, cultural and socioeconomic assets for user-defined, project-scale areas of interest in the state. This web-based tool incorporates interactive mapping and geographic information system query and analytical capabilities. The primary target audience for which the NREX tool will be designed is a group of end-users with basic fluency in the use and application of geographic information systems and geospatial data. End users represent developers, conservationists, natural resource managers and/or local government planners with interests in assessing potential place-based resource allocation concerns. 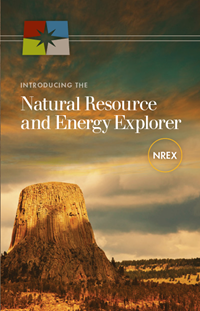 The NREX application is designed to support the Energy Atlas concept within the Governor’s Energy Strategy by providing public access to credible geographic data and information maintained by state agencies and other sources. NREX was developed under an interagency agreement between the Wyoming Governor's Policy Office and the University of Wyoming's Wyoming Geographic Information Science Center. The project is funded through the Wyoming Business Council. Development of this application was guided by the Wyoming Governor’s Policy Office, Wyoming Department of Enterprise Technology Services, Wyoming Game and Fish Department, Wyoming State Historic Preservation Office, Wyoming Department of Environmental Quality, and the Wyoming Geographic Information Science Center. Steering Committee > guided design and implementation of NREX, including access and data sharing policies, outreach and education associated with use of NREX. Steering Committee Agencies Included: Wyoming Governor’s Policy Office, Wyoming Department of Enterprise Technology Services, Wyoming Game and Fish Department, Wyoming State Historic Preservation Office, Wyoming Department of Environmental Quality, and the Wyoming Geographic Information Science Center. Partners Group > facilitate partner agency and organization participation in development and maintenance of NREX with a focus on information content. Representative data contributors include federal, state, and other organizations. End Users Group > provided end-user input into NREX design, beta testing, post-rollout evaluations. End users included consultants, industry, local governments, federal and state agencies, and Non-Governmental Organizations. NREX Brochure (pdf): tri-fold for print.